On December 2, in Copenhagen took place the opening ceremony of the 4th World Congress of the International Trade Union Confederation (ITUC) “Building Workers’ Power”. More than 1,200 delegates representing trade unions from over 160 countries of the world, who in turn represent the interests of more than 207 million trade union members, participate in the work of the ITUC Congress, which takes place on December 2-7. 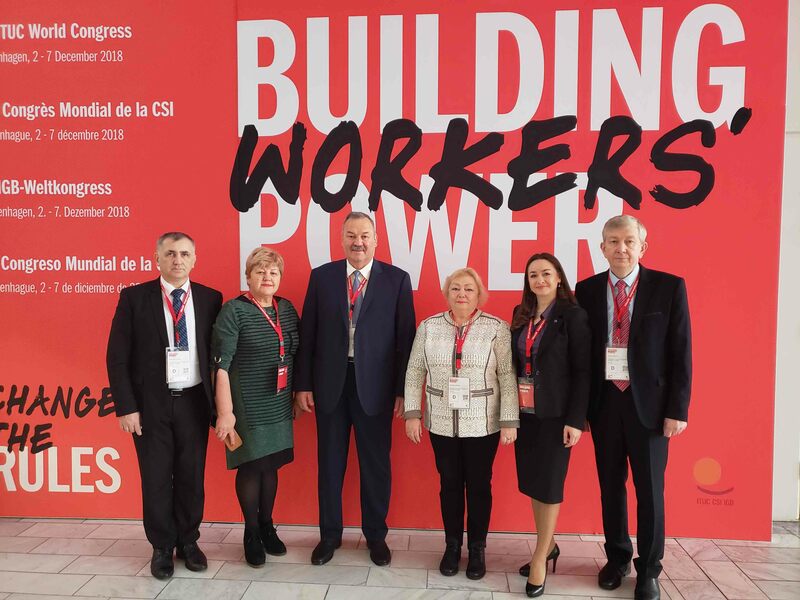 The work of the ITUC Congress is attended by the delegation of the National Trade Union Confederation of Moldova (CNSM), leaded by Oleg Budza, president of CNSM. The delegation also consists of Ghenadie Donos, President of the Trade Union Federation of Education and Science, Aurel Popovici, President of the Trade Union Federation of “SANATATEA”, Valentina Chiriac, President of the Trade Union Trade Union of Workers of Trade, Public Catering, Consumers’ Cooperative, Services, Restaurants and Hotels “SindLUCAS”, Liuba Rotaru, president of the CNSM Women’s Commission, Tatiana Marian, head of the mass media and international relations Department of CNSM. After the opening ceremony, which consisted of an unprecedented show where the culture of different parts of the world was presented, the representatives of the international trade union movement reunified in Copenhagen were welcomed by Lars Løkke Rasmussen, the Prime Minister of Denmark, Frank Jensen , Mayor of Copenhagen, Guy Ryder, Director-General of the International Labour Organization. During the reference period, delegates will discuss the strategies of the decent work, wages and social justice in modern conditions, the ITUC campaigns and their impact, as well as the election of the ITUC president and general secretary for the next period. At the same time, the Congress will adopt the policies and work plan of the ITUC for the upcoming years. The Congress will addressee within plenaries four ITUC future policy issues: Peace, Democracy and Rights; Regulating economic power; Global shifts – Just Transitions and Equality. More information about the topics discussed at the congress can be found on the ITUC website. We will come back with more details this week. We recall that the CNSM became a member of the International Trade Union Confederation (ITUC) in February 2010.